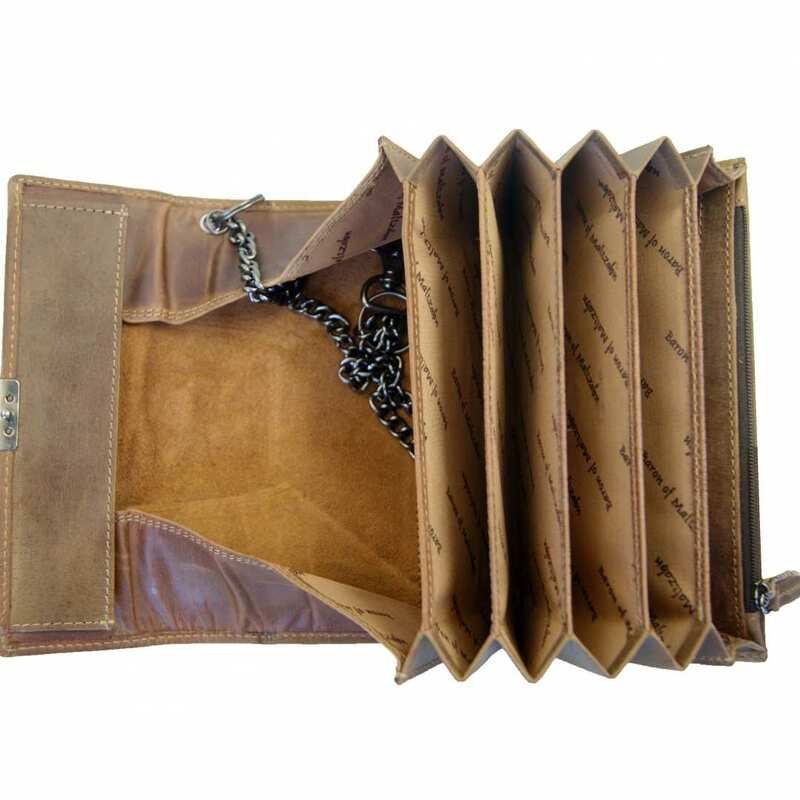 Product information "Waiter's purse GATES of brown leather"
The waiter’s purse GATES made of high value genuine leather consists of eight practical, big compartments for the right storing of coins and bills. The successful division of the inside of this wallet makes of an indispensable accessory in the everyday work life. This resistant money purse is especially designed for those who work in the restaurant and hotel industry, in order for them to handle money really tidily and quickly. Just attach the wallet to your belt by using the comfortable chain and carabiner! In the many compartments, you can comfortably store bills by their value. The coin compartment is very wide, so that change can be gripped very fast. The waiter’s purse does not only provide comfort at work, but also looks fantastic! The brown genuine leather makes of this purse a very valuable design and a stylish accessory for the daily life. The elegant appearance is rounded off by the embossed crest of the label BARON of MALTZAHN. The high grade metal fittings underline the excellent quality of the bag and guarantee a long durability, even with frequent use. 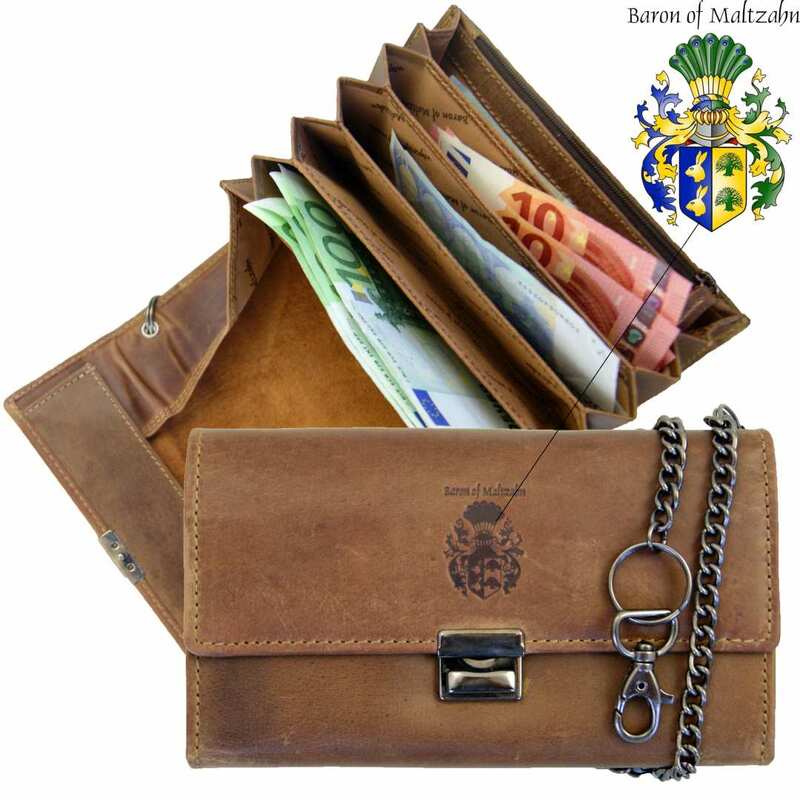 This waiter’s purse has a total amount of five bill pockets for the different banknotes and contains an extra zippered compartment that can be used as a secret pocket. Another pocket is available on the back of the wallet. The coin compartment is completely made of leather. The total dimensions of the waiter’s purse Gates made of leather are 7.1 x 3.9 x 1.2 in and therefore you will find space for all the money. To create the waiter’s purse, we only have used robust genuine leather in a shade of brown that has been sewed very carefully. The purse has also a stair buckle with three possible sizes and the chain can be easily detached. 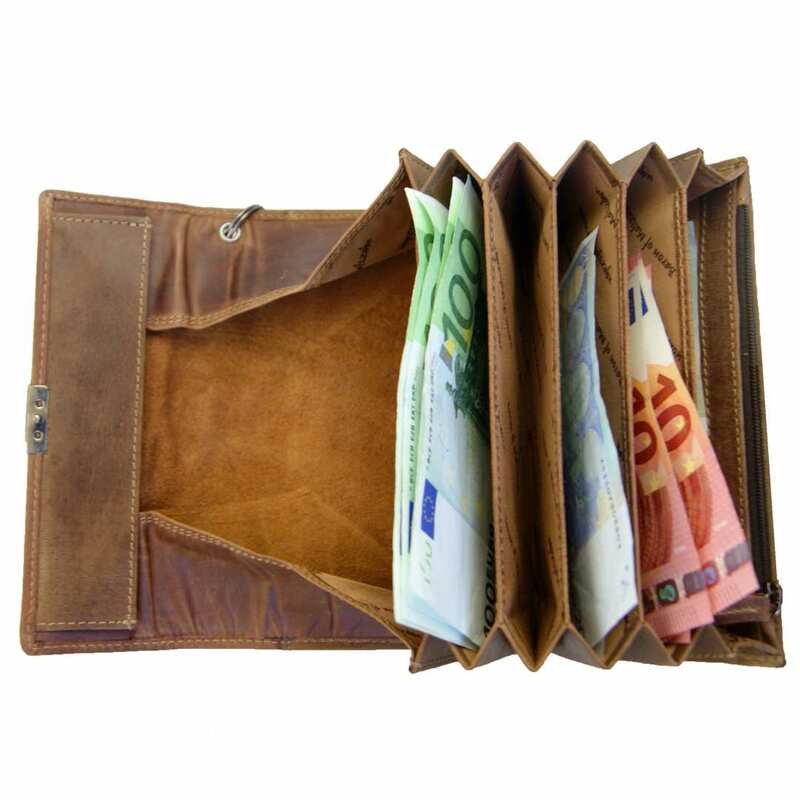 Order now the waiter’s money purse made of brown leather and discover the pleasure of spaciousness! Reviews for "Waiter's purse GATES of brown leather"